Fastly is the world’s smartest content delivery network. The Fastly Heroku add-on provides a quick and easy way to add the power of Fastly’s global content delivery network (CDN) to Heroku applications. This document covers configuration of static and dynamic edge caching with Fastly for Heroku applications. A list of plans available can be found on Fastly’s Heroku add-on page. After installation, three configuration variables are available to your application and can be viewed with heroku config:get. The default configuration works for serving static content over HTTP and HTTPS on the my-fast-app-herokuapp-com.global.ssl.fastly.net domain. Domain - The address visitors use to access your app. This is how we know where to route requests. The Fastly Heroku add-on includes access to https://manage.fastly.com via Heroku SSO and access to Fastly’s API via token authentication. Fastly’s API and configuration panel both support making configuration changes, viewing real-time and historic CDN stats, and instant purging. API Documentation is on the docs site and many helpful configuration guides can be found in our guides. We provide various language clients for interacting with the API. Once a version is activated, it becomes locked and can no longer be modified. The .global.ssl.fastly.net domain created during provisioning works out of the box, but you may want to use a more friendly looking URL. For example, to use the custom domain www.my-fast-app.com instead of the Heroku provided domain my-fast-app.herokuapp.com you add that domain to your Heroku configuration. In the same way, to use that domain with Fastly, you configure it in your Fastly service. This can be done by using SSO to login to our configuration dashboard. Navigate to the Configure tab and click the blue Configure button. Click on Domains in the left menu and then the green New button. A non-active version must be selected. Each time a version is activated, a new version is automatically created for you. You can change the version by selecting from the dropdown next to the Clone button. Enter the domain you wish to add and click Create. The domain now appears in the list of domains. Click the yellow Activate button to make the configuration change live. To use TLS/SSL with this domain, follow the instructions below in the TLS/SSL section. 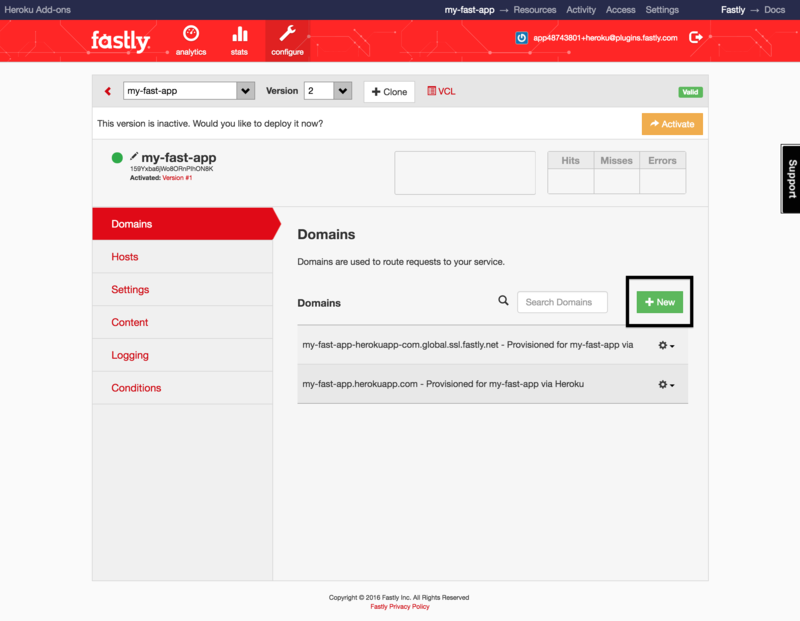 Although not required to use Fastly, we recommend you CNAME your app’s top-level domain to Fastly for the best performance. CNAME-ing will direct all requests through Fastly, providing a performance boost out of the box. CNAMEs are described in some depth in Part 2 of our blog on Accelerating Rails. In your DNS provider, CNAME your domain to point to your FASTLY_CDN_URL. Consult our DNS setup guide for step-by-step CNAME instructions for most DNS providers. If configuring TLS for this domain, wait to CNAME until after completing TLS configuration as the CNAME that you point to will be different. 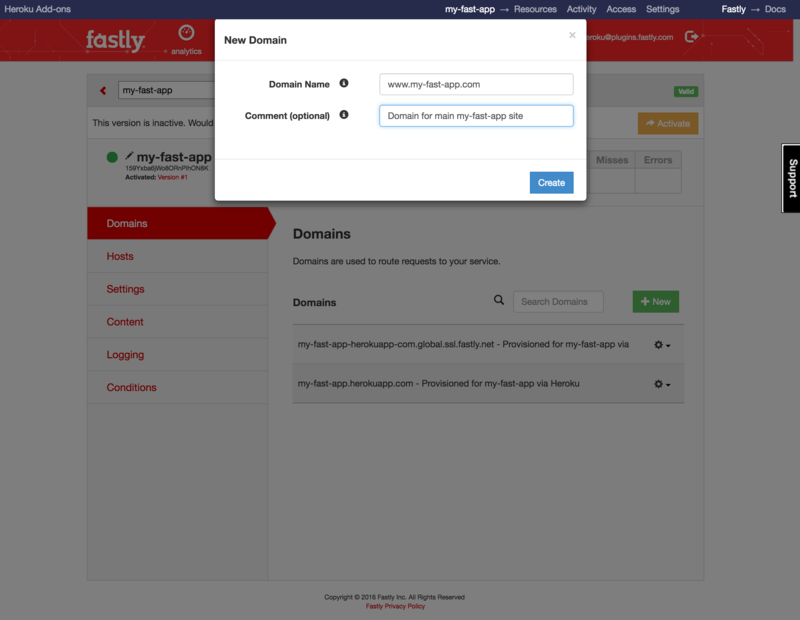 Once the DNS entry has propagated, clients will be routed to your app through Fastly’s network. Not all pricing plans include TLS Domains. To avoid disappointment, ensure your pricing plan supports TLS Domains before attempting to provision TLS. The default Fastly configuration supports TLS over HTTPS out of the box on your .global.ssl.fastly.net domain. To enable TLS on a custom domain, use our Heroku CLI Plugin to provision TLS. === Domain www.my-fast-app.com has been queued for TLS certificate addition. This may take a few minutes. ▸    In the mean time, you can continue by starting the domain verification process. This queues your domain for TLS provisioning. The requested domain must be configured in the active version of your service to successfully provision. If this is not the case, you will see the following error: Domain does not exist in your service configuration! You must configure this domain in your service to use. When the command completes you will need to verify ownership of your domain by adding the provided TXT record to your DNS configuration via your DNS provider. If domain verification has completed, the above command will output the CNAME that you’ll need to update your domain to point at. After updating the CNAME of your domain, TLS should be enabled on that domain. All TLS domains are automatically removed upon removal of the Fastly add-on. As a CDN, Fastly provides infrastructure to accelerate your applications. We put Points of Presence (POPs) all over the world and run a highly optimized network to reduce latency to end-clients. It’s helpful to know a little about HTTP performance and optimization before starting. If you’re familiar with HTTP Caching, feel free to skip to the next section. HTTP Cache-Control and Surrogate-Control headers tell Fastly what content to cache and for how long to cache it. Correctly setting cache control headers on application responses can significantly impact performance. As such, we encourage you to consider what values make the most sense for your application. In general, the longer an object’s TTL (time to live), the higher the cache hit ratio, meaning less requests back to your dynos and better response time to clients. A full list of directives is available in the specs linked above. 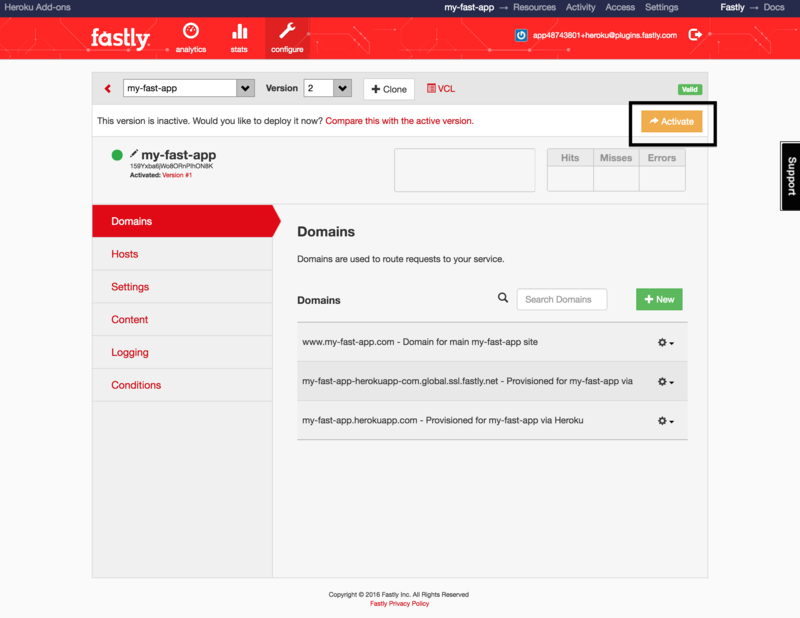 For further explanation and examples relating to Fastly, read our cache control tutorial. If you configured a custom domain with a CNAME pointing to Fastly, you don’t need to worry about configuring an asset_host since all requests will route through Fastly. Just ensure cache control headers are being set correctly with the above static_cache_control option. Asset digests (aka “fingerprinting”) is a way to eliminate the need to invalidate cached assets when they change. Although Fastly supports instant purging, many developers like to use digests so they don’t have to do any invalidation upon deploying new assets. For brevity we leave the details on asset digests to the Rails Asset Pipeline Fingerprinting guide and just note the configuration option required to enable digests. To cache static assets with Sinatra, we recommend the sinatra-asset-pipeline gem, which adds a Sprockets integration to Sinatra, much like the Rails asset pipeline. Following from the Rails asset pipeline configuration above, you can set cache control headers and digests. We recommend using the rack-cache middleware to configure cache settings. It’s also a good idea to use the Rack::Deflater middleware to compress responses. You can incorporate the express-cdn Node.js module to set up Fastly static asset caching with your Node.js applications. The express-cdn docs do not explicitly call out use with Fastly, but it works exactly the same as their docs demonstrate. In your app.js file (see this example) set the domain attribute to your FASTLY_CDN_URL (e.g., my-fast-app-herokuapp-com.global.ssl.fastly.net) or your custom domain, if using one. If you’re using django-static you can specify the MEDIA_URL as your FASTLY_CDN_URL. Fastly enables rapidly changing dynamic content like REST APIs and dynamic HTML to be cached at the edge. There are a couple different approaches to dynamic content caching outlined in the “Cache Strategies” section of Part 2 of our Accelerating Rails blog. Fastly can integrate into your application framework to leverage dynamic caching that takes advantage of our instant purge API. We provide various framework-specific plugins, listed below, to make it quick and easy to set up. Surrogate-Keys are HTTP headers that Fastly uses to associate cache keys with response objects. We’ve written a blog post that explains more about caching dynamic content. In addition, our API caching blog post series is a good place to read about dynamic API caching in more depth. We maintain the Fastly Rails plugin to cache dynamic content with Rails. The plugin contains helpers for creating cache keys, setting the required headers, and issuing purges. Check out this blog by thoughtbot on the plugin. A community maintained Fastly npm package wraps our purge API that you can leverage in NodeJS applications. We maintain a Drupal plugin that automatically integrates with our purge API. The module can be downloaded from the link and installed into your site. Check out the blog on drupal.org to learn more. A community maintained Wordpress plugin called Purgely is available in the Wordpress Plugin Directory that automatically integrates with our purge API. The source is available on Github. Check out this blog on crate.io to learn more. Want to integrate Fastly dynamic caching into a framework not listed here? Let us know! 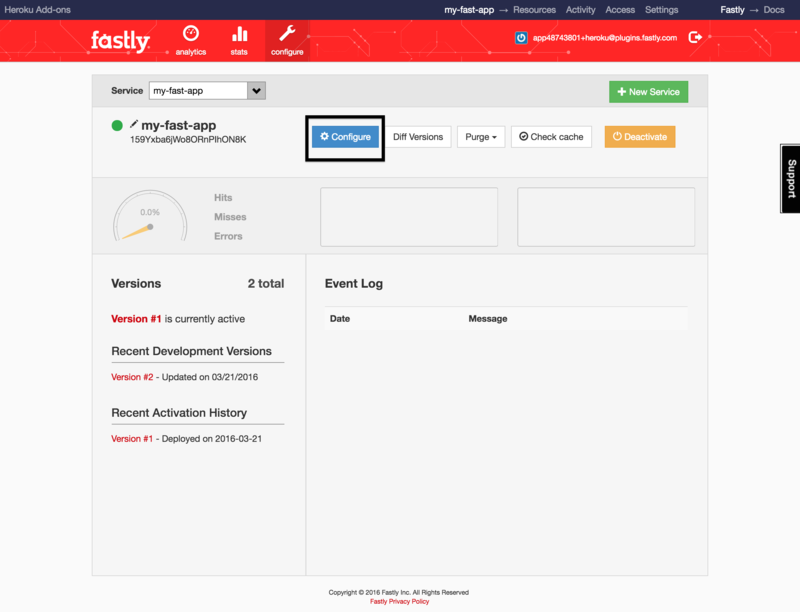 We love making it easy for all developers to integrate with Fastly. Make sure you’ve deployed the code changes listed above that configure your application for use with Fastly. Caching can sometimes be confusing. The following outlines a few steps to help verify your Fastly configuration is working as expected. Also check out our guide on testing your setup. If the domain does not match the current value of your FASTLY_CDN_URL you should double check that your application and assets are configured correctly and that the most recent code changes have been deployed. If you’re using a custom domain and did not configure a static asset host, you should see your custom domain here. If the asset fails to load (with a 503 status code), there is probably nothing wrong with your Fastly configuration, but rather the problem likely exists in your application. Ensure your application is serving the asset and check deploy logs to make sure there were no errors. Then poke around the filesystem with cd and ls to verify the presence of files and cat to verify the content. If your application is serving the correct file but it’s not going through the CDN, you can try issuing a “Purge All” from the Fastly control panel or the CLI plugin. This clears all content from the cache and subsequently forces an update by making requests to your dynos. Use “Purge All” with caution! It may take a long time to refill the cache and/or applicaion dynos may see higher load as a result of the cache filling up. Use curl to make a request to your application and verify that the response contains certain cache related headers. If your response doesn’t include the Via and X-Cache* headers, something is configured incorrectly. Below are solutions to a few issues sometimes encountered during setup. As long as the content is available from the application, we will never return a 404 (due to the “proxy” nature of the Fastly edge caches). If you’re seeing a 404 and are positive the content is available from your dyno, it’s possible we cached a 404 (see HTTP status codes cached by default) when the content may not have been available. In this case, purge the object that is 404'ing to force a cache refresh. If your application forces redirects from HTTP to HTTPS and upon installation of Fastly you see redirect loops coming from the cache, this is because you need to configure Fastly to pull content from your apps over HTTPS. By default we cache 301 redirects, which causes this redirect loop to happen. You can fix this by updating the port of your Backend to 443 (default is 80) in the Fastly configuration panel. Depending on what TTL value you use, you may need to wait for the 301 redirects to expire in the cache or issue a Purge. A Purge will force a refresh - removing the cached 301 and subsequently updating with the actual content, which will now be pulled over port 443 (the port used with SSL). It is possible for our caches to serve an expired asset if the client makes a request for an expired asset and the application dyno is unavailable. You can tune this by setting the TTL (cache expiration time) with cache control headers and using stale-if-error/stale-while-revalidate directives. If you encounter trouble loading assets (such as fonts, especially in FireFox) that are hosted somewhere other than your application dynos, you should first ensure that the host is correctly setting the Access-Control-Allow-Origin header. If you have verified your configuration and the problem persists, you can set a CORS Access-Control-Allow-Origin header at the edge via the Fastly control panel. Based on the pricing plan you select, Fastly charges a monthly flat rate for CDN service. Each pricing plan includes a fixed amount of bandwidth and requests. Be sure to choose a plan that roughly corresponds to your site’s traffic profile, as we take overages seriously. We send ample warning emails when approaching plan limits along with ample overage emails. If significantly more bandwidth is used than what’s included in your plan, we may temporarily discontinue service at anytime during the period of overage. You can migrate between plans at any time. Migrating to a different plan will change bandwidth and request limits, but does not affect any cached content. Removing the Fastly add-on will destroy all cached content and service configuration. This cannot be undone! Fastly provides a Discourse-powered community forum for questions and troubleshooting. Support is also available through other channels. You can always find us in #fastly on freenode IRC or on Twitter at @Fastly. By installing the Fastly Add-on, you agree to the Fastly Terms of Service.